Day 20 of the Heapnose Perfume Diary. 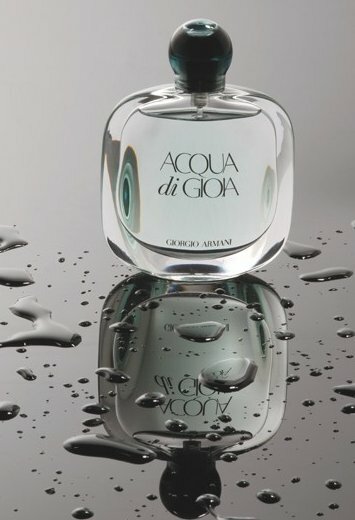 Today I’m wearing Acqua di Gioia by Armani. In 1996 Giorgio Armani released what would arguably become his most famous fragrances – Acqua Di Gio for him and Acqua Di Gio for her. The former fast became, and remains still the world’s top selling men’s fragrance, adorning the artfully whiskered jaw lines of unimaginative plebs the world over. The latter, facing stiff competition from the nineties trinity of Klein, Hilfiger and Lauren, failed to set the ladies alight, and quietly faded into obscurity: Last seen at the Duty Free Counter in Luton Airport – the elephant graveyard of the perfume world. 14 years later, Giorgio remains determined to right this perfume wrong…to give us girls our aquatic fragrance back. Hell, we got the right to vote, to go to University, to demand equal pay, to wear trousers, and according to one Heapnose reader, to cook in bigger ovens: We’ve surely earned the right to smell good as we smash through those glass ceilings. And so Armani gives us “Acqua di Gioia” a fragrance which “…celebrates woman and nature”. Inspired by a Mojito (good start) the fragrance is underpinned by the feeling of female independence – hence the deliberate absence of a man in the (concededly beautiful) ad campaign. The pro-girl power message is blurred somewhat however by the 19 year old supermodel who writhes on beaches, frolicks with horses (plural), and drinks from fresh water pools in a leafy jungle. Now admittedly I’m no trail blazer, but none of the above bear any sort of correlation with my plans for the long weekend. Woman and nature might be better represented by a pallid 26 year old, sans makeup, shuffling sluggishly around Roath Park Lake, rueing the previous night’s 11th mojito, spurred forth only by the promise of an M&S Hoi Sin Duck Wrap and an evening of searching Richard Armitage on YouTube. Still. Idole D’Armani – the last Giorgio release reviewed by your faithful nose, was elevated above High Street status by its impressive longevity, even in the face of a self loathing biscuit binge. Acqua Di Gioia fails to live up to any such standards of longevity – expect a couple of hours from this, at best. However, given the onset of summer, and the subsequent need for something a bit lighter, for once, I’m not holding that against our friend G. On a humid day in the office, or a hot day in the city, when fragrance is forced to co-exist with the twin scepters of summer; man-feet and man-pits – a refreshing fragrance, is, well, refreshing. It’s not insipid either. For all the talk of aquatics, there’s a warm, brown sugar base to this one that gives it a bit more gusto. Pat Heap really likes it, and aided by my recent acquisition (appropriation) of (someone else’s) desk fan (aka the fragrance fairy) the smell has been much commented on by office visitors. It’s not a classic – and if Giorgio was aiming as such then it falls short of the mark. But as a summer handbag mainstay, it’s great. Don’t expect the earth, and don’t pay full price for it – and you won’t be disappointed.